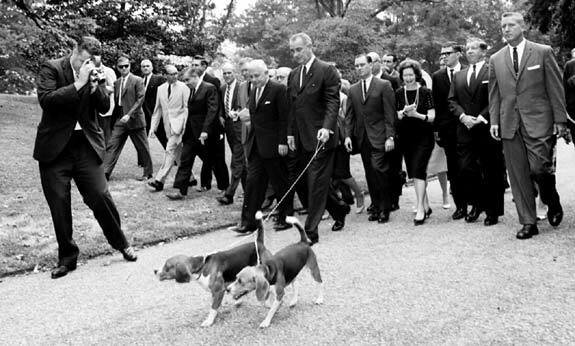 reI had the honor, of owning one of President Johnson’s Beagle descendant’s. My Dad Morris Davis and Mom Gloria Thomas Davis, knew Edith and Johnnie La Cook. They were friend’s for many year’s.Johnnie’s sister name unknown, knew and were very good friend’s with the Johnson Family.One of the litter’s maybe their daughters dog’s, Johnnie’s sister got a female. They named her Charmin, she was beautiful black light brown and white, very good natured. She had her first litter of puppies about 1966-67. I believe 66, just before my 10th Birthday.I feel in Lovewith a Boy, he was light with light brown spot’s, absolutely beautiful Instantly feel in Love with him. When we went to Rosebud Tx to visit, they could’nt keep me away. Well, on the night of my Bithday, we took a trip to Rosebud to visit and I ran to get the Pup. Reached in, but he was’nt there! I ran around asking about him, and found they had given him away.I thought, oh man,I was past upset, and spent my Birthday crying. Late that night, sometime around midnight we headed home.I laid down on the seat, laid my head in their lap. Could’nt sleep a wink, just thought about the Pup, and cried. All of a sudden, I felt a wiggle, and heard a whine, Dad said get up. To my amazement, surprise, happiness all rolled into one, there lay my Pup! Dad said, Happy Birthday, and boy was it.The happiest one ever. I named him Brownie, we spent many happy day’s together. A very happy, and playful dog, best ever.One day, I went outside, and could’nt find him anywhere.Day’s went by, no Brownie.He had dug out under the fence, we lived at 1206 South 43rd Temple Tx.A few day’s later, he crawled back under the fence, as I walked outside. We ran to each other, as fast as we could.I hugged him, he licked my face, we were very happy seeing each other. Well, many week’s went by, and next thing I know, he dug out again. I sat on tge back porch for hours on end watching and waiting for him. I put my head in my hand’s and started crying.Then, I heard a bark, looked up and he was walking up and down our fence line between our house, and the Rose family home.IS got up ran over to the fence, and he took off barking. I started running for the back gate, when IT’S heard him getting closer, and stopped to look. Here he came, barking like crazy, and running back and forth.Next thing I know, he disappear’s for a second, then come’s back.He had a line of Pup’s behind him, with Mama bringing up the rear. He litterally paraded them back and forth past the fence. Then, I knew where my Pup had been. A very Happy, and Proud Dad.In a while, they disappeared down the Alley. In about an hour or so, here he was, climbing back under the fence, for the night. So, from then on, I knew, where my Pup was. His heart torn between two places, but now that I’m older, I know who his heart truly belonged too. Aww, how sweet. Thank you for sharing your story. 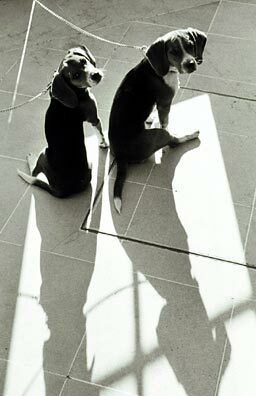 When Brownie came by to show off his Pup’s, their Mom was a Beagle too. What are the chance’s of that happening? Who’d figure. 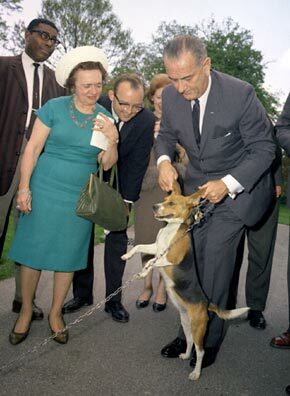 Somewhere in Temple, there are descendant’s of President Johnson’s Dog’s gggrand dog’s.